Antonio “Shades” Agee, a passionate Detroit native and public figure, was an active participant in the creation of the Detroit graffiti scene as one of the first documented graffiti artists in the city. Growing up in the Motor City, Shades has drawn invaluable influence from his father, a successful jazz musician. Being surrounded by the sounds of legends like Nat King Cole and Frank Sinatra shaped his early years, implanting an appreciation for the arts while inspiring further creativity. Always intuitively attracted to the graphic arts, Shades explored ways to express his work throughout the streets of Detroit. He began to practice aerosol artwork (also known as graffiti) shortly before the hip-hop phenomenon hit Detroit, making graffiti” a more household name. Over the years, Shades has integrated his cultivated array of techniques and styles with his old school urban flair, resulting in stunning visuals and colorfully complex compositions. This talent has provided opportunities for Shades to produce his graffiti on an international scale, from custom murals and canvases to commissions and sponsorships. Since the early 90s, Shades has grown his roster of clients to include automotive players like Chrysler, Ford, and Toyota, and major organizations like Universal Studios, FIFA World Cup, Children’s Hospital of Michigan, Pandora, and Vitamin Water. Shades also has two pieces archived at the Detroit Institute of Arts (DIA) and has exhibited his work at C-Pop Gallery and Motor Gallery, among other venues. 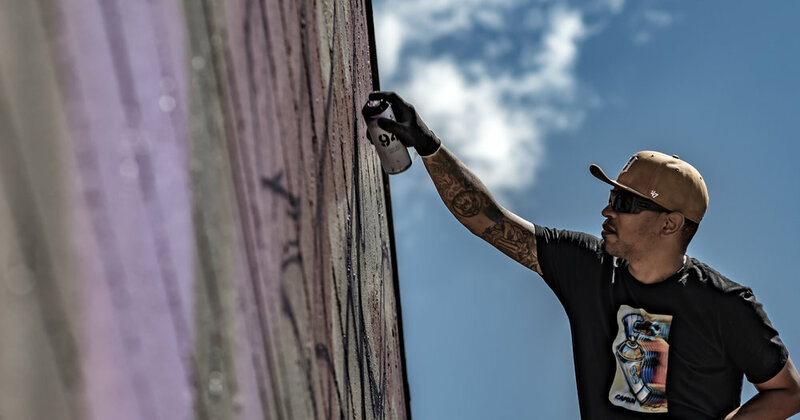 As a prominent force in the evolution of graffiti as a world-renowned art form, Shades continues to challenge himself with new and exciting opportunities.